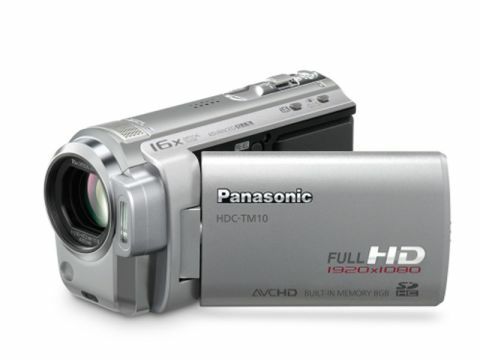 While it's not the 'lightest camcorder in the world', the new Panasonic HDC-TM10 does boast to be 'the world's lightest Full HD AVCHD camcorder'. Weighing only 280g, it shares this enviable accolade with its little brother, the equally dinky HDC-SD10. Amazingly both of these camcorders are small and lightweight enough to fit in a jacket or trouser pocket. Although, you'll need fairly loose-fitting trousers if you want to try it. On paper, at least, the silver/black Panasonic HDC-TM10 ticks all the right boxes. For starters, it offers a great way to record HD video (in full-fat, 1920 x 1080 resolution) and to capture detailed still photos. There's also a 16x optical zoom, with 40x and 1000x zoom modes available when you activate the digital equivalent. The versatile Panasonic HDC-TM10 offers dual storage options – you can record your movies to the 8GB of built-in flash memory or save them out onto SD/SDHC cards, which can be slotted in to boost the capacity. Invest in a 32GB SDHC card, for example, and it could hold eight hours of HD footage filmed in the HDC-TM10's normal 9Mbps HX mode. The higher-quality 1920 x 1080 pixel picture modes – HA (17Mbps) and HG (13Mbps) – will obviously chew up more of the storage space. The eight hour capacity drops to five hours 20 minutes for HG and four hours for HA. Conversely, the lower quality 1440 x 1080 HE mode (6Mbps) can eke out the available space to store around 12 hours of video.